The future of wireless is decentralized. Mesh-type networks are slowly making their way into the WiFi standard, and soon enough we’ll be dealing with decentralized phones. That’s wireless, but what about electronics? For most embedded work, we’re dealing with masters and slaves, but what if we didn’t have to deal with that? This is the challenge of modular electronics, and this week’s Hack Chat is going to be talking all about that. 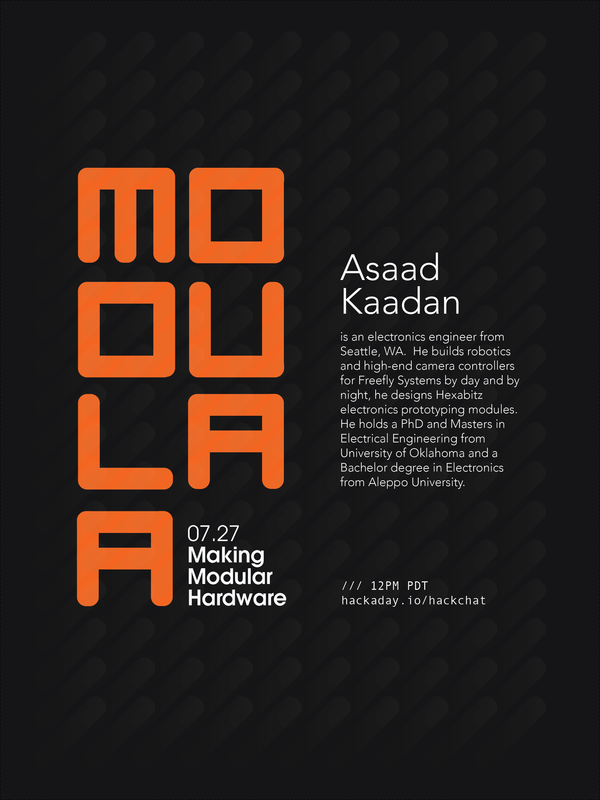 Our guest for this week’s Hack Chat is [Asaad Kaadan], an electronics engineer from Seattle. [Asaad] holds a Masters and PhD in Electrical Engineering from the University of Oklahoma. For his day job, he builds high-end camera controllers for Freefly Systems. By night, he designs Hexabitz electronics prototyping modules. What are Hexabitz? That’s where this is about to get interesting. Hexabitz are, as you would expect, tiny little hexagons packed with electronics. Every hexagon has a microcontroller on board, and these hexagons connect together through solder pad connectors along the edges of the board. Before you ask, yes, there are pentagonal Hexabitz, so yeah, you can do that. Our Hack Chats are live community events on the Hackaday.io Hack Chat group messaging. This week is just like any other, and we’ll be gathering ’round our video terminals at noon, Pacific, on Friday, July 27th. Need a countdown timer? Yes you do. While the Internet of Things is here to stay, and will kill us all, there are a few places left on the planet that will remain unscathed during the robot uprising. These underserved communities still have a need for communications and networking, leading [hlew] to create a Community Engagement Mesh Network as an entry for The Hackaday Prize. While there are many, many options available for DIY networking solutions out there today, [hlew] is leaning on some work done by some of [Bruce Land]’s students at Cornell. This project used simple and cheap nRF24 radio modules for a true mesh network with multi-node communication, dynamic route discovery, and dynamic route reconfiguration. The CEMN will rely on this network to provide communications to underserved communities. The primary goal of this network is to broadcast information like crop reports and health advisories, but it can also be used for peer to peer communications between individuals. Which Wireless Tech is Right For You? It seems these days all the electronics projects are wireless in some form. Whether you choose WiFi, Bluetooth Classic, Bluetooth Low Energy, ZigBee, Z-Wave, Thread, NFC, RFID, Cell, IR, or even semaphore or carrier pigeon depends a lot on the constraints of your project. There are a lot of variables to consider, so here is a guide to help you navigate the choices and come to a conclusion about which to use in your project. We can really quickly reduce options down to the appropriate tech with just a few questions. If internet service providers go down, how are we going to get our devices to communicate? 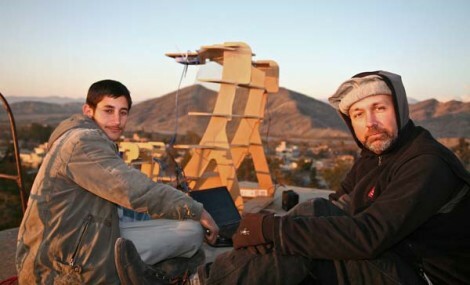 Project Byzantium aims to create an “ad-hoc wireless mesh networking for the zombie apocalypse.” It’s a live Linux distribution that makes it easy to join a secure mesh network. [B1tsh1fter] has put together a set of hardware for running Byzantium on Pis in emergency situations. A Raspberry Pi 2 acts as a mesh node, using a powerful USB WiFi adapter for networking. Options are provided for backup power, including a solar charger and a supercapacitor based solution. The Pi runs a standard Raspbian install, but uses packages from the ByzPi repository. This provides a single script that gets a Byzantium node up and running on the Pi. In the background, OLSR is used to route packets through the mesh network, so that nodes can communicate without relying on a single link. The project has a ways to go, but the Raspberry Pi based setup makes it cheap and easy to get a wide area network up and running without relying on a single authority. People get CT and MRI scans every day, and when [Oliver] needed some medical diagnostic imaging done, he was sure to ask for the files so he could turn his skull into a printable 3D object. [Oliver] is using three different pieces of software to turn the DICOM images he received from his radiologist into a proper 3D model. The first two, Seg3D and ImageVis3D, are developed by the University of Utah Center for Integrative Biomedical Computing. Seg3D stitches all of the 2D images from an MRI or CT scan into a proper 3D format. ImageVis3D allows [Oliver] to peel off layers of his flesh, allowing him to export a file of just his skull, or a section of his entire face. The third piece of software, MeshMixer, is just a mesh editor and could easily be replaced with MeshLab or Blender. [Oliver] still has a lot of work to do on the model of his skull – cleaning up the meshes, removing his mandible, and possibly plugging the top of his spinal column if he would ever want to print a really, really awesome mug. All the data is there, though, ready for digital manipulation before sending it off to be printed. If you need a way to make openings in your project enclosures look nice just head on over to the 3D printer. In the image above [Alfred] is showing off the result of his Slic3r hack for printing mesh grills. It’s important to note that you need to make sure you’re using Slic3r version 0.9.8. This won’t work with newer versions because starting with 0.9.9 the software will add a raft to the bottom of your design. The grill can be in any shape you desire. It starts by modelling this outline, then extruding the edges downward the same distance as your desired mesh thickness. After importing the design file into Slic3r [Alfred] uses the support material settings to choose this honeycomb design. He then sets the fill density to zero. This means the design will not be printed at all, only the fill material, resulting in these honeycomb screens. Slic3r’s a fantastic piece of software. Check out this interview with Slic3r’s lead developer. The wooden frame seen above hosts a parabolic reflector making up one side of a wireless network link. This is a Fab Lab project called FabFi which uses common networking hardware to setup long-distance wireless Ethernet connections. It’s a bit hard to tell in the image above, but the reflector focuses radio waves on the antennae of a router we’re quite familiar with, the Linksys WRT54G. It’s held upside-down in an enclosure meant to protect it from the elements. The node above manages to complete a connection spanning 2.41 miles! One of the core values of the project is to develop hardware that is easy to build with limited resources, then to make that knowledge freely available. Anyone who has the ability to download and print out the 2D design file can build a reflector for themselves. As we’ve seen in other projects, paper stencils and hand tools can handle this job with no need for a laser-cutter (which was used for the prototype). WRT54G routers are inexpensive and the project uses the open source firmware OpenWRT. They can be run from 12VDC power which means a car battery works when mains power is not an option. The system has been running in Afghanistan for two years and hardware failure is still in the low single-digits.